On 19 February 1962, the 1-29 FA was assigned to the 5th Infantry Division, at Fort Devens, Massachusetts. It was relieved on 15 December 1970, and assigned to the 4th Infantry Division, at Fort Carson, Colorado. Finally, in late 1990, she was deactivated as part of the Army's drawdown. Gulf War Unit Motto: "Pathfinders"
the 2-29 FA returned to Baumholder, and the 8th Infantry Division, in May 1991. In 1994, the battalion was assigned to Fort Lewis, Washington. Finally, in 1996, she was deactivated as part of the Army's drawdown. Note 1: The Gulf War Combat Historical Summary is provided! Note 2: The Gulf War Personnel Rosters are provided! and is still located at Fort Carson, Colorado. Currrently the unit is commanded by LTC Michael Kelliher. 8th ID Unit Motto: "Warhawk Thunder"
1st AD Unit Motto: "Iron Thunder"
In October 1996, the 4-29 FA began redeploying from it's peacekeeping mission in Bosnia Herzegovina. Redeployment ended in late November 1996, ending their ten month deployment. In February, 1997, the battalion was redesignated to the 4th Battalion, 27th Field Artillery. The 4-27 FA is assigned to the 1st Armored Division, stationed in Baumholder, Germany. The 5-29 FA was deactivated, when the 4th Infantry Division reflagged to Fort Hood, Texas, in December 1995. Note 1: HHB's Unit Motto: "The Cutting Edge"
as part of the Implementation Force in A/94 FA and other division units. Now stationed in Baumholder, Germany, it is part of the 1st Armored Division. Note 1: A brief autobiography of BG Lynwood B. Lennon, Bn Cdr (66-67), is provided! Note 2: A transcript of the Annual Historical Summary, 66 - 69, is provided! Note 3: A transcript of the Presidential Unit Citation, DA GO 69, is provided! Note 4: A Officer's Roster of 6-29 FA, Vietnam, 1966-1967, is provided. Note 5: Maps of 6-29 FA, Vietnam Areas of Opns, is provided. Note 6: A Enlisted Roster of A/6-29 FA, Vietnam, 29 Oct 1967, is provided. Note 7: How to join the Spotswood deWitt Chapter (6-29 FA), 4th Infantry Division Association. Note 8: A personnel listing of Svc Bty, 6-29 FA, 1984-1987, is provided. Note 9: A career profile of COL John M. House, the last Battalion Commander, is provided! Existed from about 1976 until 1984 when the Regiment was reformed! In 1978, assigned in Germany with the 3rd Infantry Division. In 1978, assigned at Grafenwohr, Germany with the 1st Armored Division. 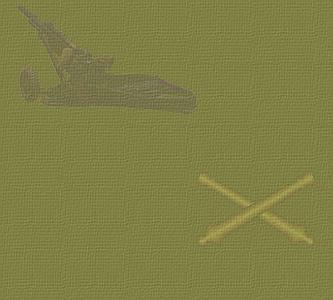 In 1984, redesignated as Battery B (TAB), 25th Artillery. In 1977, assigned at Fort Hood, Texas with the 2nd Armored Division. In 1976, assigned at Fort Carson, Colorado with the 4th Infantry Division. In 1976, assigned at Fort Hood, Texas with the 1st Cavalry Division. In 1978, assigned at Fort Polk, Louisiana with the 5th Infantry Division. "word of mouth" from people that served during this period. provide me with the specifics, and I'll oblige by adding it! Initially attached to the 1st Bn, 30th FA, for about a year,B Bty, 29th FA was then attached to the 4th Bn, 60th Artillery, 41st Artillery Group of the I Field Force Artillery, and operated out of Qui Nhon, An Khe, and Tuy Hoa. NOTE 1: A transcript of the Annual Historical Summary 1965-67, is provided! NOTE 2: A transcript of the Presidential Unit Citation, DA GO 69, is provided! Unit Motto: "Fighting Fire Flies"
Bty G (SLT), 29th Artillery was attached to the 1st Bn, 44th Artillery, and supported the 3rd Marine Division in the northern I Corps area. Based at Dong Ha, and Da Nang, they operated from Phu Bai in the south, to Con Thien in the north, and Khe Sanh in the west. Note 1: A transcript of the Unit Historical Summary, 67-71 is provided! Note 2: A transcript of the Personnel Rosters, 67-70 is provided! Note 3: A transcript of the Americal Division History is provided! Note 4: A story entitled 60 Minutes of Terror at Mary Ann is linked! Note 5: A partial transcript of the Gimlets Last Patrol is provided! Unit Motto: "Light For The Fight"
Bty H (SLT), 29th Artillery supported operations in the IV Corps area. The 1st Platoon was based out of Bac Lieu, in support of the 21st Division (ARVN). The 2nd Platoon was based out of Dong Tam, in support of the 9th Infantry Division. and the 5th Special Forces. Note 1: A transcript of the Annual Historical Summary 67-68 & 70 is provided! Note 2: A transcript of the Personnel Roster, October 1967, is provided! Note 3: A transcript of the Personnel Roster, October 1968, is provided! Note 4: 2nd Platoon Motto - "Hurry Sundown"
to the II Field Force Artillery at Long Binh (north of Saigon). the Bty relocated to Fort Polk, Louisianna with the 5th Infantry Division. and provided suppport for the 4th Infantry Division. The battalion was commanded by a LTC Brewer. At this time, the 4th Infantry Division Artillery was commanded by GEN Harlan H. Harkness! At some point the 29th FA Bn had relocated, and was at Bad Neuheim, Germany, from 1954 to 1956. It is currently unknown what happened after that. Note 1: A Map of D-Day 4ID Unit Positions is provided! Headquarters and Headquarters Battery, 29th FA was inactivated 14 February 1946. Through a series of reorganizations, the unit was the basis for the formation of the Searchlight Units of Vietnam! the unit ultimately became the 1st Battalion, 29th Field Artillery, on 1 September 1971. Battlefield Commission - Was the 1SG! the unit ultimately went on to serve in Vietnam. 3rd Battalion, 29th Field Artillery ! Service Battery, 29th FA was inactivated 14 February 1946. LTC George L. Mabry, Medal of Honor recipient, and a highly decorated soldier. He was ranked the second most decorated, just behind CPT Audie Murphy! on February 4, 1919 without ever deploying to the European Theater. Research has not yet provided any substantial information on the structure within the 29th Field Artillery during this period. However, it must have been similar to the 30th FA, which at that time consisted of 2 battalions! The 1st Battalion, with Batteries A, B, and C, and the 2nd Battalion with Batteries D, E, and F. All gun batteries were manned with 4 officers, about 200 enlisted, and had six gun sections, of 4.7 inch/120mm Rifled Guns (Horse Drawn). It is unclear exactly how the command and control structure worked within the Headquarters & Combat Trains element! 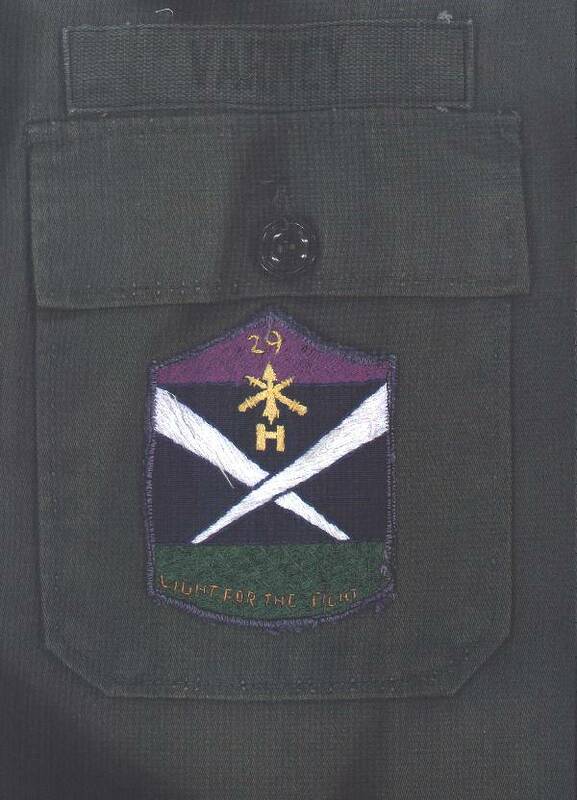 Note: The H-29 "pocket patch" graphic was created by Leon Baldwin!